Ever have a craving for Tex Mex but still want to feel good about what you’re eating? I do . . . basically every day ;) I want that spicy, smoky, salty, creamy, crunchy goodness of Tex Mex, without feeling like I need a nap after lunch. Which is why I am loving this easy Chipotle Caesar Salad with Salmon and Queso Fresco lately. 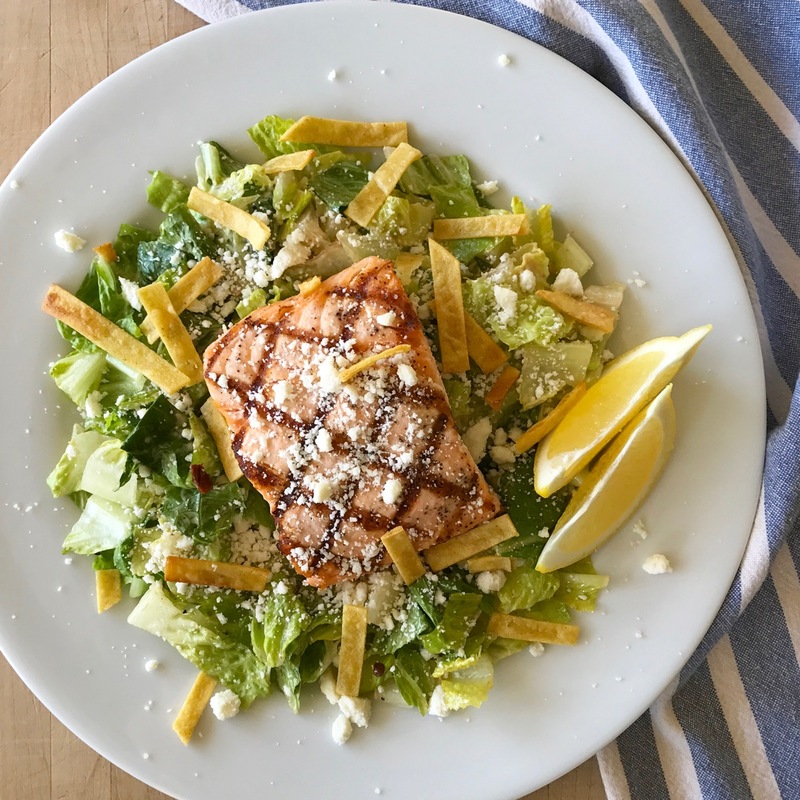 You start with tender hearts of romaine, chopped and tossed with spicy chipotle Caesar dressing, and then top the salad with grilled salmon, queso fresco crumbles and crispy fried tortilla strips. Spicy, smoky, salty, creamy, crunchy, satisfying AND good for you, all in one? Sign me up! But wait, it gets better. The ingredients are super simple and so is the method. All you need are: organic hearts of romaine, a prepared Caesar dressing that you love, diced chipotle peppers in adobo sauce, La Vaquita Queso Fresco, corn tortillas and olive oil, and finally, a protein — such as grilled salmon — to add on top. At our local HEB, I can always find my favorite Caesar dressing on the salad-dressing aisle, chipotle peppers in the Mexican foods section, and corn tortillas on the tortilla end cap. To find La Vaquita Queso Fresco, however, you might need to do a bit more digging. First, head toward the refrigerated aisle with cheese, milk, yogurt. Look up toward the top few shelves for a stack of round, white circles. See the circles of cheese? Once you have the all the ingredients, the salad is easy to throw together. Chop or tear the romaine into salad-size pieces. Next, pour the chipotle Caesar dressing over the lettuce and toss to coat. Place equal portions of salad on two large plates. Then add the grilled salmon (or other protein). Now it’s time for the fun part! Covering the salad with Queso Fresco crumbles! So break off a piece of the Queso Fresco wheel . . .
. . . and crumble the Queso Fresco between your fingers until it looks like snow. For extra crunch, you can fry a handful of corn tortilla strips in a little olive oil, season with salt and then throw them on the salad, too. Place the chopped romaine lettuce in a large bowl. In a small bowl mix together the 1/4 cup Caesar dressing and teaspoon of chipotle. (If you like a lot of dressing, you can always double the measurements.) Pour the dressing over the lettuce and toss to coat. Using tongs, place equal portions of the lettuce onto two large plates. Place one piece of grilled salmon on top of each salad and set aside. Over a small bowl or cutting board, use your fingers to crumble the Queso Fresco into small pieces. Place cheese crumbles in a 1/3-cup measuring cup to measure the amount of crumbles as you go. Then sprinkle equal portions of the Queso Fresco over the salad and salmon. Heat 1/4 cup light olive oil in a small pan over medium heat. When oil is hot (shimmery but not smoking), add the corn tortilla strips to the oil and fry for about 10-15 seconds, or until lightly browned and crisp. Remove from oil and set on a paper towel; season with salt while still warm. When cool, sprinkle fried tortilla strips over each salad, and garnish with lemon wedges. This post is sponsored by La Vaquita Cheese; however, all opinions are my own.